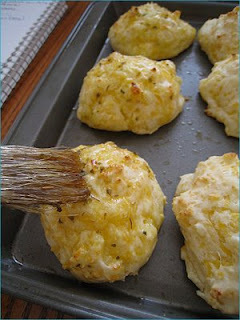 1 pack buttermilk biscuit mix (I used Bisquick, about 1 1/2cups) 1 1/2cups shredded cheddar cheese 1/2 cup milk 2 tbsp butter 1 tbsp oregano (you can omit or use less) 3/4 tsp garlic salt 1. Preheat oven to 400F. Spray cooking sheet with non-stick spray. 2. 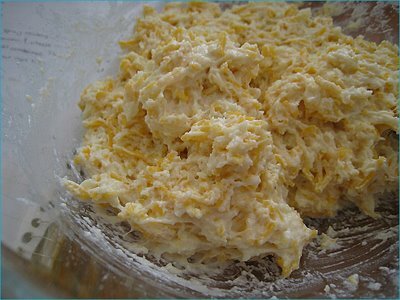 Put biscuit mix, cheese and milk in a bowl and mix well to form a sticky dough. 3. Using spoon, drop lumps of dough onto cookie sheets 1.5in apart. Bake for 10min. 4. 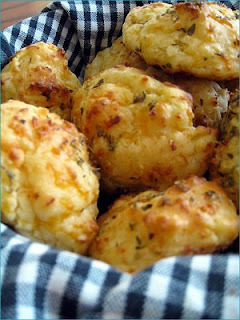 In a bowl, melt butter and mix with oregano and garlic salt. 5. When the timer goes off, take them out and brush with butter mixture and bake 5min at 400F and another 5-6min at 350F.